I was curious how this delicious pastry filled with fruit and creamy pudding came by its name. Napoleons seem to be a Neopolitan invention as they originated in Naples, Italy. The French adopted the dessert, calling it “mille-feuille” or “ thousand leaves” for the many layers of pastry. As the dessert traveled from France the description of their place of origin, Neopolitan, became corrupted to the more familiar Napoleon associated with France, but there is no evidence that Emperor Napoleon had anything to do with these particular pastries. Napoleons traditionally have a confectioners sugar glaze on top (1 Tablespoon water to 1 cup of confectioners sugar) but I eliminated this to control the sweetness (and carb count). They are also typically larger in size and frequently have 3 to five layers of pastry. We prefer the little sweetheart size as portion control – but also because the easiest way to eat this crispy delicacy is to pick it up and carefully take a bite! If you choose the knife and fork method – still easier to eat the small ones. You can substitute frozen strawberries. They just won’t have the heart. (pun intended!) I do not add sugar to the berries to keep the calorie and carb count lower. If berries are on the tart side, though, you might want to consider adding a couple of tablespoons of sugar to the sliced berries while waiting for the pastries to bake and cool. Using two layers of pudding mix helps to hold the pastry and strawberries together. I use chocolate discs for drizzling, but you can substitute about 1/3 cup of semisweet chocolate chips or dark chocolate chips. This was the first time I drizzled chocolate — move very quickly to keep lines thin and straight! Otherwise you’ll end up with a squiggle! Your sweetheart will think you spent hours on this spectacular treat! A mini version of a classic dessert made of flaky pastry filled with fruit and creamy pudding. Chocolate drizzle and heart shaped strawberry optional. Spray cookie sheet lightly or line with parchment paper. Unfold pastry sheet on lightly floured surface. Cut along fold lines to make three separate pieces; then cut each third into sixths. Place the pieces on cookie sheet and bake for 15 minutes until golden brown. Remove from baking sheet and cool. While pastries are baking, mix pudding and 1 cup of milk in large bowl according to package directions. Gently stir in whipped topping. Refrigerate until pastries are cool. If using fresh berries, wash stem and slice. To make heart shapes, cut notch across the top of the berry before slicing. Split cooled pastries in half, working gently with sharp knife. Spread layer of pudding mixture on bottom half of pastry, add a layer of strawberry slices. Add another layer of pudding mixture and top with other half of pastry. Repeat until all pastries are filled. Spoon a bit of pudding mixture on top of filled pastry and add one or two strawberry slices. Place 12 chocolate discs in disposable decorating bag or corner of zipper sandwich bag. Microwave in 30 second bursts until chocolate is melted. Snip off point of decorating bag or corner of zipper sandwich bag. Drizzle chocolate quickly over the completed pastries. Repeat with remaining 12 discs if needed. Refrigerate until serving up to 3 hours. Thanks for sharing this delicious recipe at Simple & Sweet Fridays. Following you on FB and Twitter! Your Napoleon Sweethearts are just awesome, what a special dessert! Hope you are having a great Valentine weekend and thank you so much for sharing with Full Plate Thursday. 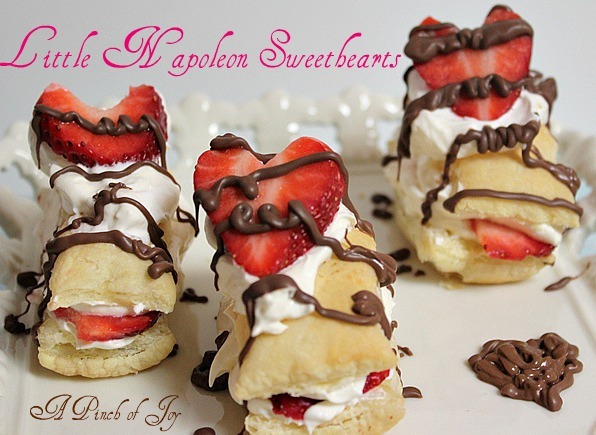 Napoleons were my favorite dessert as a kid! These bring back memories! I would love it if you’d share this at Saturday Share with Us!